The Cuisinart CRC-400 4-cup rice cooker features a high-quality stainless-steel steaming basket inside and a nonstick cooking bowl that produces up to 4 cups of rice. The cooker also steams vegetables and thin cuts of meat, creating a complete, fat-free meal with little effort. Besides various types of rice, the cooker cooks couscous, polenta, oatmeal, boiled eggs, shrimp, and much more. 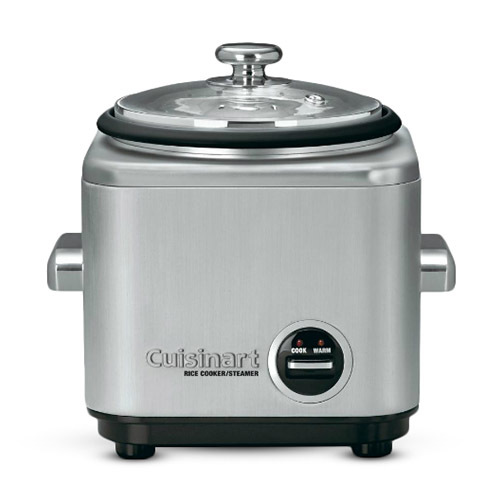 The 4-Cup Rice Cooker Brushed Stainless Nic has many exciting features for users of all types. You can extend the lifetime of your 4-Cup Rice Cooker Brushed Stainless Nic with the purchase of a FactoryOutletStore Factory Protection Plan. See the 4-Cup Rice Cooker Brushed Stainless Nic gallery images above for more product views. 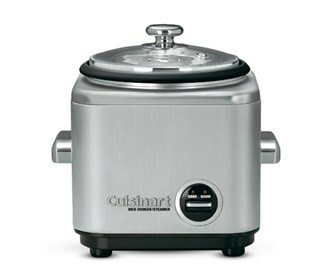 The 4-Cup Rice Cooker Brushed Stainless Nic is sold as a Brand New Unopened Item.